The ONLY trio performing today with 2 genuine members of the Motown recorded Supremes! They also performed with Diana Ross on the "Return to Love" tour and continue to perform all over the world, bringing back wonderful memories of the greatest female group ever! They have appeared with Tom Jones, The Four Tops, James Brown, The Temptations, and at Wembley Arena, The Royal Albert Hall, and QE2. From "Baby Love" to "Someday We'll Be Together" and every hit in between, there is no other group authentically performing Supremes' hits like The FLOS! 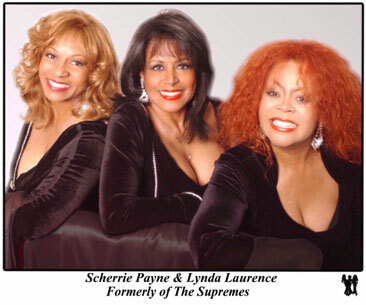 The history of Motown & The Supremes continues with Scherrie Payne & Lynda Laurence, formerly of The Supremes!